As Kate and I studied my fit model wearing a Campbell & Kate prototype back in 2009, Kate had the brilliant idea of adding a seam down the sleeve to take up the "fabric arm flab" that makes a woman with a large bust look sloppy and larger than she really is. When we narrowed the sleeves, I called the design my "dream shirt" because we took care of an issue I had never dreamed of addressing. It turns out that because a narrower sleeve means a narrower and therefore higher armhole, this single design decision also addressed other important issues described below! 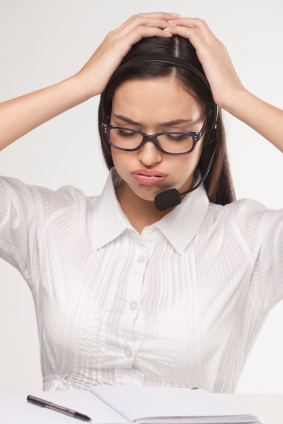 "Oh I get get it--you put the buttons closer together to get rid of the gap!" That's what most people say when I introduce them to Campbell & Kate shirts, but they're only seeing part of the story. Until I began designing the Campbell & Kate Signature Shirt, I didn't realize that there are two types of gap: the two-dimensional gap, and the three-dimensional gap. Below is a classic example of the 2D gap. A 2D gap goes East/West or Left/Right, and it occurs when there isn't enough fabric for the bust. When there isn't enough fabric to cover a large bust, it doesn't matter how close together the buttons are. You're going to get a 2D gap--or, at the very least, 2D pulling. That's why I love the current image on the Campbell & Kate shop page. My 32F model's pose almost always results in a 2D gap for women who wear a D cup or higher, but here there is none. We didn't use any photoshopping or pinning to reach this result. Neither did we put the model into a larger size. Her measurements call for an 8M shirt, and that is what she is wearing. There is simply enough fabric allocated for the bust. A 3D gap, on the other hand, can be addressed with closer buttons. 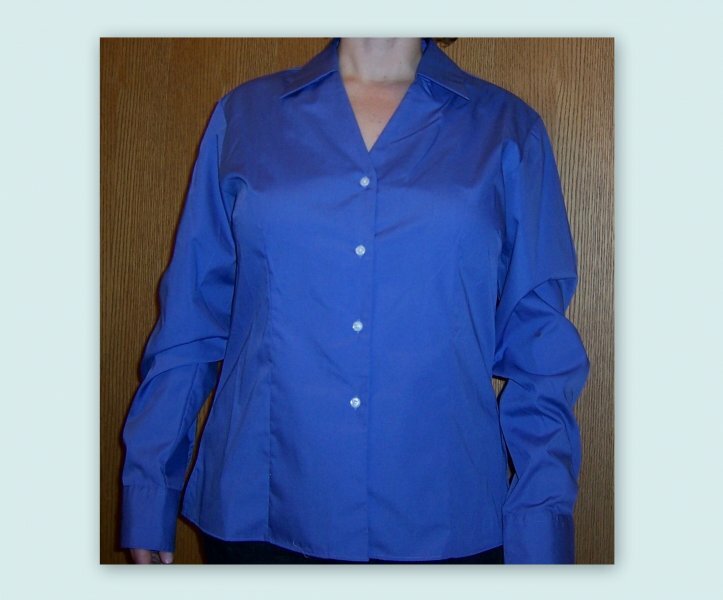 A 3D gap results when the top fabric panel--the one with the button holes--separates from the bottom panel to which the buttons are sewn. As you can see from the photos below, this is a universal issue for all women, not simply those with large busts. 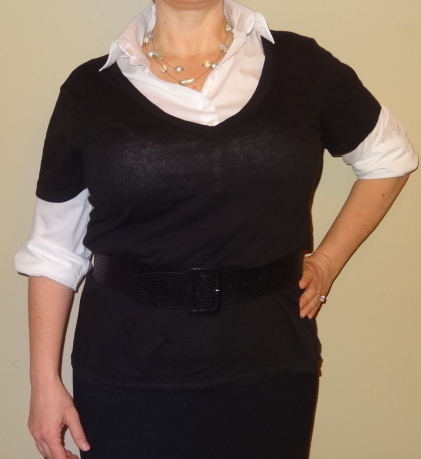 For many of us, a camisole is the classic solution for cleavage control, but when my standby camis recently went missing, I discovered that a classic Campbell & Kate shirt is an excellent alternative. Below, I get even more mileage from an extremely deep V-neck J.Crew tissue tee by layering it over my 14L Campbell & Kate shirt. Big Busts Don't Lie: How Will New Technology Help Women Who Wear D Cups and Up Order the Proper Size Online? The greatest challenge in shopping online is getting the right fit. I'm not going to advertise that buying a Campbell & Kate shirt online is easy, but I'm proud to say that the longer we're in business, the more we find that our customers are getting their sizes right on the first try. 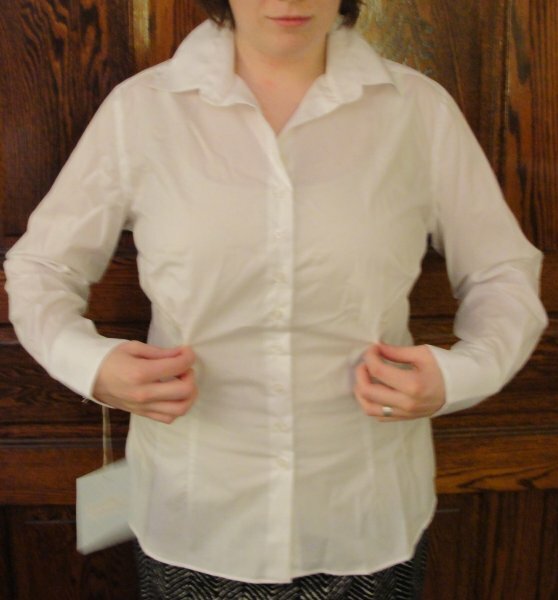 It helps that we actually offer shirts made specifically to fit a large bust and slim waist. Companies like True Fit, described in this Wall Street Journal article, are trying to streamline the process. Unfortunately, they have replaced the tape measure with other complicated questions, like "Where does your tummy sit on your belly--high, medium or low?" Good news for those of you who are unsure what size Campbell & Kate shirt to order--the Buy1Try3 Program is up and running. A customer who tried it last month graciously provided photos of the process, despite looking, as she described it, "like a hot wrinkled mess." Since she was our guinea pig, I'll call her "Ginny". Ginny tried sizes 10S, 10M, 10L, 12S and 12L. Both size 12's were too baggy, as evidenced by the photo above, but take a look at the size 10's after the jump to see what size you think she should have kept. I'll tell you what size she chose at the very end. 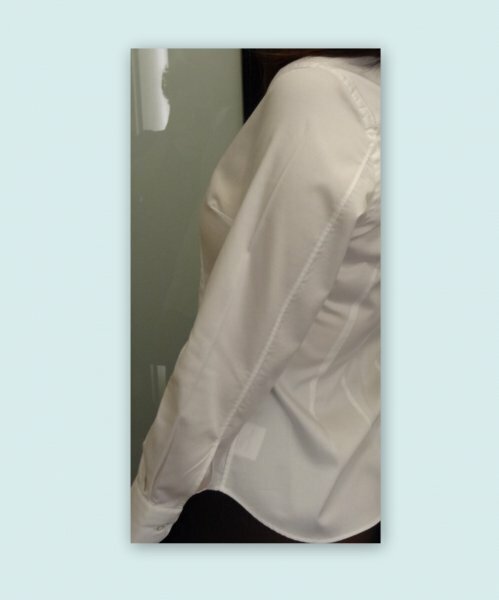 As I ironed this shirt for my husband last week, I found myself daydreaming about how much I love crisp white button fronts. "If only women like me could have a shirt like this," I mused, and then stopped short. Women with large busts DO have a shirt like this, and I'm the one who created it. How embarrassing to have forgotten, but after a lifetime of battles with baggy shirts that still required a safety pin at the bust, old thinking dies hard. I laughed at myself for forgetting that the war is over. 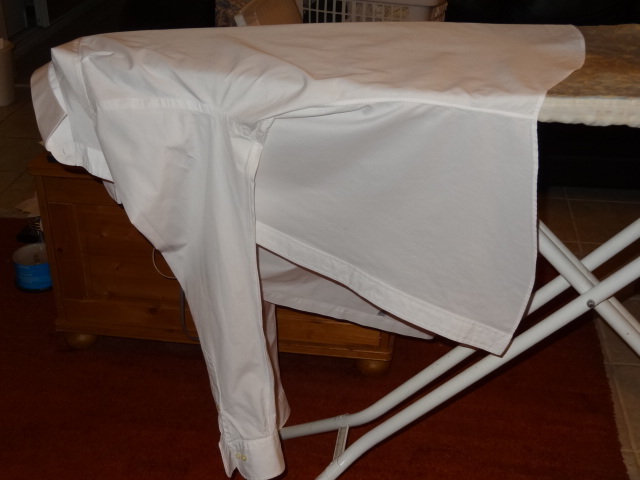 Four reasons I iron my husband's shirts after the jump . . . In Part 1, the key word was "discretion". Today's word: creativity. Actually, if you're a woman who wears a D cup or higher, you don't have to be that creative. You need only wear your Campbell & Kate shirt. Other women who wear a D cup or higher will tell you how amazing you look, and you will simply tell them where to find us. D Cups and Up: Can You Handle the Curves? This warning sign should come with Campbell & Kate shirts. That’s because, although most women with a large bust adore the way they look in them, a few are shocked to encounter their own curves. It’s easy to understand why. Many ready-to-wear garments drop straight from the widest part of the full bust straight down to the hem, hiding the waist. When this freefall is tailored, the waist and bottom half of the bust are revealed. See what I mean after the jump. Bra La Mode is holding its debut "intimate affair" here in New York City on Sunday, January 29, at the famous Bra*Tenders at 630 9th Avenue. Come meet the "bralebrities" that my friend Moira has lined up AND find out which of Campbell & Kate's 18 sizes is right for you. Sitting next to this group of co-workers on the Long Island Railroad recently, it was obvious that the two women were on top of their professional game as they discussed financing options for the client they were going to meet. It was also obvious that they were not on top of their appearance game. Both wore plain dark suits with unremarkable tops beneath their jackets, and neither wore any makeup. Perhaps they'd spent the entire night preparing for the meeting to which they were traveling and had only had a few minutes to grab their easiest go-to outfit before catching the train. Understandable though their situation might be, they were each basically wearing a uniform, and they looked boring. That's also a common criticism of the classic white shirt--that it's too "uniform looking" and boring. However these women demonstrate that it's not what you wear that causes you to blend in with the scenery. It's HOW you wear it. Do you see any color in this photo? Any inkling of the women's personalities other than their preference for nice leather bags and an addiction to email? Fortunately, it doesn't take too much effort to overcome the "Stepford worker" message sent by the ubiquitous black laptop next to the window. 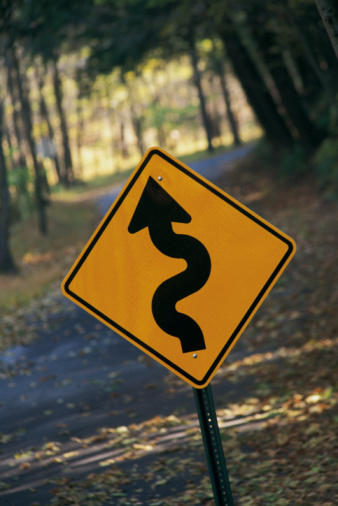 If you're also in a rut (and who hasn't been? ), here's a list of ideas to reclaim your personality in the way you dress and, more importantly, the way you see and feel about yourself.